Too many families and communities have been personally and tragically affected by the opioid overdose crisis in Canada. 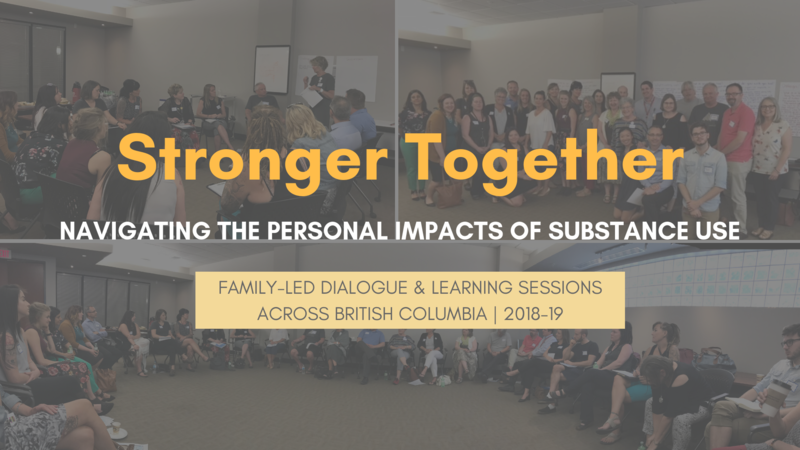 In response to the unsupported and unresolved challenges experienced by families affected by substance use, Stronger Together is a series of dialogue and learning sessions for families and allies impacted by substance use. Community knowledge will be documented and used to inform substance use service planning, as well as research directions, in British Columbia. In partnership with Moms Stop the Harm, Parents Forever, From Grief to Action, the BC Bereavement Helpline, and the five regional Health Authorities, we will be hosting Stronger Together sessions in key communities across BC in 2018-19. With thanks to the Community Action Initiative for funding. If you are a family member with a loved one who is using substances or has died from substance use, or a service provider supporting families, you are invited to attend these sessions. The 2.5-hour dialogue sessions are focus groups to identify local challenges and support needs, and explore systemic solutions to addressing gaps in substance use care. Community knowledge will be used to inform health service planning, delivery, and research directions. The one-day learning sessions are for individuals and professionals who wish to learn how to facilitate support groups for families affected by substance use. It will review aspects of traumatic loss or active substance use, different types of support groups, safety and containment, what it means to be trauma-informed, how to address power dynamics within the group, how to interview members, and more. Participants will be provided with activity examples and facilitator resources. Dates and RSVP information for additional Stronger Together sessions in Island, Fraser, Vancouver Coastal, Northern, and Interior regions to come. With thanks to many additional organizations who are supporting with the local community events.